Badges are the little icons that appear at the bottom of the Windows 8.1 lock screen. They exist to tell you something about your computer at a glance, without having to log on — how many e-mail messages are unread, whether your battery needs charging, and so on. Some badges just appear on the lock screen, no matter what you do. For example, if you have an Internet connection, a badge appears on the lock screen. If you’re using a tablet or laptop, the battery status appears; nothing you can do about it. Mostly, though, Windows lets you pick and choose quick status badges that are important to you. The programs that support the badges update their information periodically — every 15 minutes, in some cases. If you have a badge on your lock screen, the lock screen app that controls the badge has to wake up every so often, so it can retrieve the data and put it on the lock screen. Putting everything on the lock screen drains your computer’s battery. 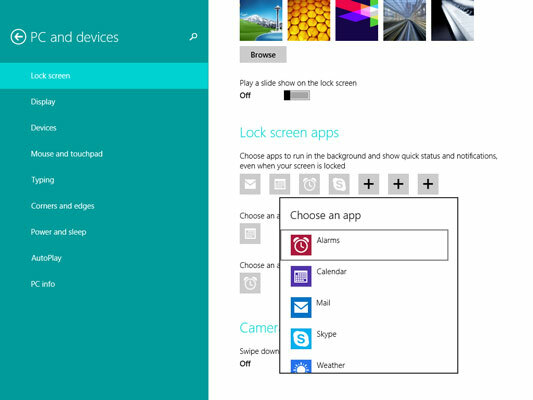 1On the Start screen, swipe from the right or hover your mouse in the upper-right corner to bring up the Charms bar. At the bottom, choose the Settings charm. 2At the bottom of the Start Settings pane, tap or click the Change PC Settings link. Then, on the left, click or tap the PC and Devices link. 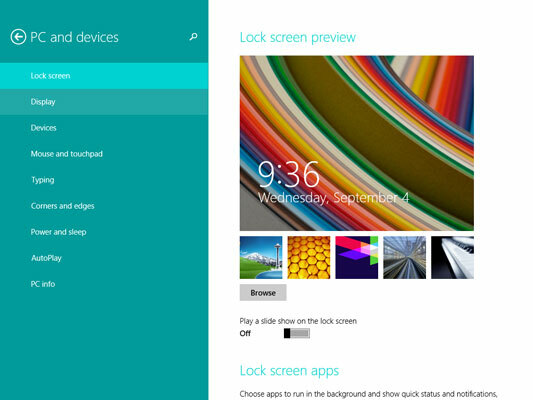 The Lock Screen Preview window appears. 3Select Lock Screen on top. At the bottom of the screen are three rows of grayed-out icons. The first row of seven icons corresponds to seven badge quick status locations on the lock screen. They appear in order from left to right, starting in the approximate location you see in the shown figure. In theory (this doesn’t always work), you can choose which badges appear, and where they appear, in order from left to right. 4Tap or click one of the icons, and then choose which display badge you want to appear in that slot on the lock screen. If you don’t want any badge to appear in that slot, choose Don’t Show Quick Status Here. Apps have to be specially designed to display the badge information on the lock screen. 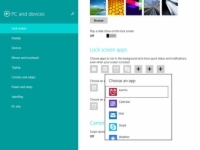 You’re given a choice of all the apps that have registered with Windows as being capable of displaying a quick status badge on the lock screen. As you add more apps, some of them appear spontaneously on this list. If you choose Don’t Show Quick Status Here, the gray icon gets a plus (+) sign, indicating that it isn’t being used. No badge appears in the corresponding slot on the lock screen. 5At the bottom of the page, you can choose which app(s) displays the extra-large detailed status, corresponding to the date and time shown. The detailed status app has to be specially designed to display the large block of information. The alarm app has to be able to create alarm notifications. You’re done. There’s no Apply or OK button to tap or click. Go back out to the lock screen — press the Windows key or button; tap or click your picture; choose Lock — and see whether you like the changes. If you don’t like what you see or you’re worried about unnecessarily draining your battery with all the fluff, start over at Step 1. Somewhat bizarrely, this is also the location where you tell Windows that it’s okay to take a picture while the lock screen is locked. Just slide the Use Camera from the Lock Screen slider to On. The method for taking a picture varies depending on your computer. If it isn’t obvious, you’ll have to look at the owner’s manual for help.